As league play is in its final weeks and the playoffs are on the horizon, here at the top ten rankings for the 4A classification! Defending champs will be perched at the top until somebody knocks them off. Don’t expect this to happen anytime soon. The Vikings continue their undeafeated mark against Washington state teams. Gotell’s 51 points in Friday’s didn’t hurt the Bruins’ cause in solidifying themselves high in the rankings. Matty McIntyre’s Bullpups are the Beasts of the East. Many familiar names from the football championship squad. Can’t drop the Lions too far down considering their only in-state losses were to Lincoln and Curtis…by a combined seven points! The Titans don’t rebuild, they reload. The second Eagles team in the top ten rankings is flying high once again on the Sammamish plateau. The Tigers are hot on the heels of the Bullpups for the GSL lead. 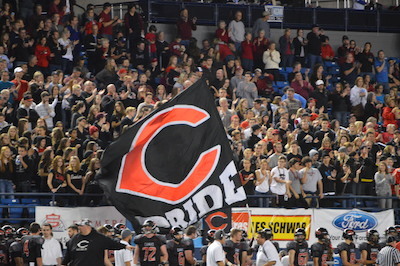 One of the top teams in one of the strongest leagues in 4A earns the Bears top ten honors. Tony Miller is a force to be reckoned with. Scored 20 in a win last week, 42 in a loss. Go figure. The second round of the gridiron postseason featured a marquee matchup between a strong pair of 4A programs in Newport and Bellarmine Prep. Both teams entered the contest with a 7-2 record and a ticket to the final eight up for grabs. Despite cold temperatures and chilling winds, both sidelines were packed with enthusiastic fans rooting on their schools. The home team got down to business early as the Knights found the end zone twice in the first frame; once through the air and the other on the ground. A 51 yard Drew Sample reception and 52 yard scamper by Conner Baumann created an early 14-0 lead. Baumann’s 6’3 222lb frame continued to punish the Lions’ front seven by notching two more TDs in the first half. The Lions built some momentum late in the 2nd by punching in two scores from QB Lou Millie to Garrett McKay. After trailing 21-0, it was evident that if Bellarmine were to stage a comeback, they would not be able to surrender another score. At the half, the Knights led 28-14. Both teams exited the locker room with a mindset of increased defensive intensity. Lion linebacker Brandon Thompson and Knight D-line captain Bennett Long were two standout performers on defense, assisting in the process of forcing punts. The lone fumble of the contest was recovered by Newport at the 7:19 mark of the third and appeared a touchdown was the only thing separating them from securing a victory. Minutes later, Bellarmine found themselves in the end zone on a Jamal Ervin run. Newport’s fifth and final TD came early in the 4th, a 54 yard grab by Sample. Trailing 35-21 with only three minutes remaining, the Lions pulled within a score on a McKay touchdown. After a quick three-and-out by the Knights offense, Bellarmine had the ball once again. A run by Ervin and a two point conversion that appeared incomplete to the Newport sideline brought the game to a 35-35 tie. The hungry BPHS defense forced a turnover on downs less than a minute later and set up kicker Matthew Philichi for a game winner from 20 yards out. The ball sailed through the uprights and sealed an improbable comeback for the 2012 state runner-up. Bellarmine ventures on, Newport finishes with a respectable 7-3 record. On the same night Bellarmine Prep Lions’ former quarterback Sefo Liufau made his homecoming as starting quarterback for the Colorado Buffaloes against the Washington Huskies, Bellarmine was set to host a first-round playoff game at Mt. 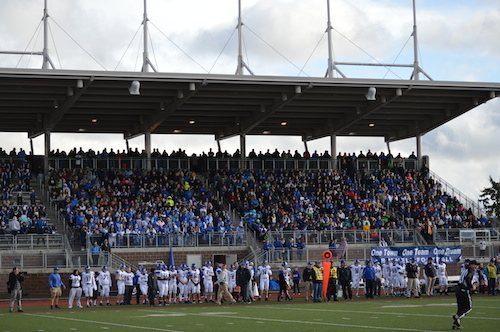 Tahoma High School in Tacoma. The perennial 4A powerhouse from the Narrows League was the runner-up in the state finals last year with Liufau at the helm and ended the regular season at 7-2 eager to visit the Tacoma Dome in December once again. However, the Kamiak Knights from the Wesco League were eager to apply their ground-and-pound attack to challenge the Lions. The scoring spree started early as BPHS Lou Millie tallied a touchdown on a 19-yard QB keeper. On the ensuing kickoff, Bellarmine recovered a fumble and capitalized on one of Nathan Goltermann’s four scores of the ball game. Kamiak responded by incorporating their big tight end Henderson Belk in the aerial attack, culminating in a 24-yard TD reception. However, the Knights could not stop the balanced offense of Prep and trailed 42-14 at halftime. An early touchdown after the half by Goltermann allowed the clock to roll without stoppage as Bellarmine led by over 40. Kamiak found the end zone for the third and final time on a one-yard QB sneak by Connor Alexander. The Lions’ reserves were incorporated in the second half and a 56 yard scamper for six by Ahmad Lewis put an exclamation point on a well-executed game by the home team. Bellarmine advances to the round of sixteen, Kamiak’s season is over. In a great atmosphere at Mount Tahoma gym, the Bellarmine Prep Lions faced off against the Federal Way Eagles with a trip to regionals on the line in the West Central/Southwest District match-up. Both teams came out evenly matched and neither team built a lead greater than two points in the first quarter. Bellarmine Prep senior Sefo Liufau led the way for the Lions with five points and five rebounds in the quarter to take a two point lead into the second. Federal Way began to use more zone defense in the second quarter, mixing in a 2-3 and a 1-3-1 to try and break up Bellarmine’s rhythm. The defensive scheme seemed to catch the Lions off guard, and the Eagles forced six turnovers in the quarter and took a 25-24 lead into the half. Brayon Blake led the comeback for the Eagles with six points in the second. Behind two three-pointers in the third from seniors Isaiah Flynn and Carson Hollyoak, Bellarmine captured their biggest lead in the game 38-31 with 1:44 remaining in the third. 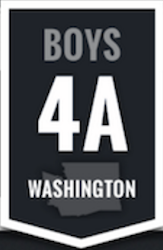 Despite turning the ball over six times to Federal Way’s two, Bellarmine played excellent half court man defense to hold Federal way to just six third quarter points. The Lions took a seven point lead to the fourth. Federal Way began their comeback early in the final quarter, cutting the lead to just two on a free-throw from sophomore Malik Montoya with 3:42 remaining. Lucas Meikle for the Lions answered with two free-throws of his own, but Brayon Blake responded with a layup and a one for two showing from the line to cut the lead to just one. Bellarmine added free-throws from Jacob Salazar to extend the lead and eventually closed out the contest with a win, 48-46. It was a great game to watch.